Notably, neither "she who stole gas" as the president called the PM, nor any other major figures from the government were there to defend the recently-approved budget. The show's presenters allowed many remarks to remain unchallenged. They allowed Yushchenko to drone on far to long. Ukraine's parliament, the Verkhovna Rada, by a huge across-the-board majority, today supported a no-confidence motion against the National Bank of Ukraine. They demanded president Yushchenko sack its head, Volodymyr Stelmakh. In total 380 deputies voted for the motion, 149 from PoR, 154 from BYuT, 31 from NUNS, 27 Communists, and 19 from speaker Lytyvyn's bloc. An investigative committee report on the activities of Bank during the financial crisis had been presented to the VR. The investigative committee have forwarded material they had gathered and scrutinised to the Prosecutor-General's office for further investigation. In the light of PM Tymoshenko's accusations and allegations that the president had covered up Stelmakh's alleged corrupt activites [see previous blogs], the VR vote places the president in a very tricky position. Today he had met a delegation of Ukraine's leading bankers during which the demanded greater openness and transparency from the NBU. Tomorrow [Wednesday] in the VR, BYuT will demand the resignation of chairman of the National Bank of Ukraine, Volodymyr Stelmakh, according to an article in 'Korrespondent'. A parliamentary commission investigating allegations of corrupt activities at the NBU, which may involve even president Yushchenko and his secretariat, met yesterday. "According to the preliminary conclusions of the commission, and on the basis of these conclusions, the information which the prime minister of Ukraine revealed live on TV, has been completely confirmed. [See previous blog ]. These conclusions will be declared at tomorrow's parliamentary session, and, most likely, will lead to a change of the entire leadership of the National Bank of Ukraine," said BYuT deputy Valery Pysarenko. He also has added that BYuT has not yet 'pencilled in' any possible nominee for the post of NBU chair. The parliamentary commission report is not yet written into tomorrow's parliamentary agenda, and has to be proposed and voted on tomorrow. Party of Regions trouble-maker deputy Nestor Shufrich today declared that Stelmakh's report in parliament, could most likely end with demands that the President dismisses Stelmakh. "If the President does not do it, then obviously the next step of the coalition would be to begin procedures to impeach the President for providing cover for, and being an accomplice to, currency speculation. If BYuT initiates this, I do not exclude Party of Regions supporting this initiative," emphasised Shufrich. The VR set up a temporary investigative commission to look into the NBU's activies on 18th December. On December 20th the prime minister sensationally claimed that as a result of illegal operations carried out via the Nadra bank, the organizers, including President Yushchenko, NBU bank chairman Stelmakh and the head of the President's secretariat Viktor Baloga, planned to rake off 4.55Bn hrvnya. Your blogger notes that while not providing concrete evidence of illegal activities by the NBU, PM Tymoshenko did give details, of disproportionately large suspicious transfers of state funds to Firtash's Nadra bank. E.g. the state 'Ukreksimbank' received about 7 times less that Nadra. If Tymoshenko's allegations were baloney, they could be easily disproved. Nevertheless, there is a slight whiff of kangaroo court hanging over Stelmakh. The big question is, will PoR support BYuT and vote to 'decapitate' the NBU chairman? And if this happens, will the president suffer the same fate? p.s. 'Segodnya' reports that PoR and BYuT may be working together for combined VR and parliamentary elections in the Spring. 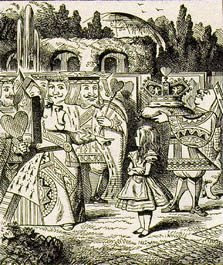 *In Lewis Carroll's much-loved children's story "Alice's Adventures in Wonderland", (published 1865), The Queen of Hearts goes around constantly shrieking this phase, and not much else. On December 18th, PM Tymoshenko demanded the immediate resignation of Head of National Bank of Ukraine Volodymyr Stelmakh. A day later, on television, she accused president Yushchenko, Stelmakh and head of the president's Secretariat Viktor Baloha of illegal speculative operations via the Nadra bank, in which they could have 'raked off' over 4.5Bn hryven. Now the first President of Ukraine, Leonid Kravchuk, has sprung to her defence. He claims that her casting the spotlight on allegedly corrupt shennanigans in the NBU, and the subsequent creation of a parliamentary investigative commission, have cooled the speculative flare-up and are helping to increase the value and stabilize the national currency at more realistic levels. According to Kravchuk, the turbulence in the currency market has bred huge discontent amongst ordinary people and may even be generating a pre-revolutionary situation, "and the people who are responsible for the stability of the national currency, for fighting economic crime, for guaranteeing the rights of citizens – they are [all] closing their eyes to blatantly criminal schemes taking place in the currency market," said Kravchuk. "It is very good that a person from the higher eschelons of power has been found that has dared to call matters by their proper names, and has appealed to the people, because there was no other option," he added. On Monday, newly-elected VR speaker and wily old fixer Volodymyr Lytvyn is to meet both Yushchenko and Tymoshenko to consult on this week's parliamentary debates on tackling the economic crisis. And in an interview in the current 'Dzerkalo Tyzhnya' he suggests that if proposed, the experienced duo Vitaliy Hayduk and Serhiy Tyhipko would be broadly supported in the VR and they could soon return to the cabinet to help sort out the current economic mess. Today, at a press conference, PM Tymoshenko sensationally blamed, in no uncertain terms, our old friend Dmityro Firtash and the Presidential Secretariat for the hryvnia’s collapse. She accused the president of covering up and benefiting from major financial speculation. "The budget of Ukraine has become hostage to a huge speculative operation.. the 10 hryven to the dollar exchange rate, makes it impossible to sell gas, which we import, on the internal market. It makes it impossible to buy nuclear fuel, medicines for people, makes it impossible for people to pay back [dollar] credits which they took out for example, for apartments," she complained. "Prime Minister of Ukraine Yulia Tymoshenko promises to turn to international organizations who investigate into laundering illegally acquired money if the National Bank of Ukraine [NBU] does not stabilize the hryvnia’s value in the nearest future. Yulia Tymoshenko stressed that the actions of the national bank may be assessed as "a banal crime", and called on to open a criminal case against them. Note: According to the Constitution of Ukraine the major function of the NBU is to ensure the stability of the monetary unit, and the Council of the National Bank of Ukraine elaborates the basic principles of monetary and credit policy and exercises control over its execution. I was moderating the comments today and inadvertently deleted the latest comment by one of the Anonymous commenters. My apologies. BTW, the hryvna is at 9.20 on the street today. Internals in some banks are predicting 10 by years end. I was told this yesterday when the hryvna was at 8.20. Not hard to believe today. The real show is on the ground. The rest is just sideshow. These guys live in a bubble and not only Yuschenko who deserves his share of the blame. They have no idea how this is affecting the people on the ground but they still play their game of musical chairs. And the worst of it won't hit until spring. "BYuT, part of NUNS, and Lytvyn's Bloc [LB], with the support of the Communists have created a pro-NATO, pro-nationalist coalition, which, while having an insufficient number of votes but being supported by the Communists, will realise an anti-nation policy. A prominent point of their coalition agreement was the question of priority of entry into NATO without a referendum, i.e. without the agreement of the Ukrainian people. Other particularly troubling points, are those which mention "strengthening the defence of Ukrainian national and spiritual identity", i.e. forced Ukrainianisation." The PoR declaration mentions the withdrawal from school syllabuses of a particular novel about the 'Great Patriotic War', and goes on..
"The Communist fraction not only did not condemn such heresy by the current authorities, but supported the authorities and its coalition with its votes in parliament. PoR considers this fact an unprecedented betrayal by the Communists and LB of its nation and electors. Combining falseness, lies and insidiousness, the new 'short-count' coalition has only one purpose – to keep the Tymoshenko government in power. The coalition agreement is complete eyewash. It does not contain a serious program for overcoming the crisis. At its core are ideological messages formulated by supporters of NATO and forced Ukrainisation. PoR warns all those who today supports the new orange-communist adventurists that they will be held responsible before the nation..
We solidarise with the nation, who, with the start of strikes and protests that are already rolling across Ukraine, are expressing their 'no' to the bungling authorities and their Communist 'yes-men'." PoR' sulking and half-truths [on the NATO issue] are very predictable...But with only 175 parliamentary deputies, they really need Lytvyn's bloc and the Communists if they are to form a coalition together with pro-presidential portion of NUNS when/if the newly-formed coalition falls apart. Despite being the largest party in parliament, they always seem to be responding to events, rather than dictating them - maybe this is the reason for the nasty statement above. The unofficial leader of the pro-coalition portion of NUNS, Borys Tarasyuk, claims that despite their low number, with the aid of the Communists and some PoR deputies, the new coalition will be able to operate successfully in parliament. But the biggest loser is president Yushchenko - he has lost control of his own party.. He called for the establishment of a normal dialogue between Kyiv and Moscow. He was against the cutting off of Russian channels from Ukrainian cable TV customers, and against the subject of the Holodomor "being transferred into the area of ethnocide," which was being done "for export". He added that a VR committee had decided recommendation of an investigative commission report on alleged supply of weaponry to Georgia be looked into on Friday. Speaking on the current political situation, he said: "Today there is an attempt to tear parliament apart and lead Ukraine to elections in conditions of deepening crisis." He said the president does not support the newly-formed coalition. Following the surprise appointment of a new parliamentary speaker yesterday, tonight PM Tymoshenko addressed the nation in a TV broadcast. "...You know that the situation in the Ukraine was recently complicated by a consciously created amoral political crisis, which made it simply impossible to resist by financial-economic means. A paralysed parliament, irresponsible, empty criticism, aggression and black propaganda - the reasons for these were a shallow fight for the second presidential term at any price. But there is good news too. Yesterday, in the parliament, a new coalition of three political forces was formed: of our fraction [BYuT], the NUNS bloc and Volodymyr Lytvyn's bloc. Volodymyr Lytvyn was finally elected a speaker for parliament. The Parliamentary political crisis has ended. Tomorrow, in the VR normal operations will resume. Our hands are freed from shackles. Kremlin plots, state mutinies, denial of the right of people to elect their President, [all of which president Yushchenko accused Tymoshenko of..LEvko] have been exposed as banal untruths. I want to thank all political forces, fractions, people deputies, who by their voting yesterday ended this political disgrace and created a coalition. All these positive steps were made not with the aid of the President, but in spite of his active opposition to the creation of the coalition. But now our priority in parliament, after overcoming the political crisis, will be dedicated to overcoming all that is wrong and normalization of the life of each one of you...."
"..... And this is only the beginning of normal operation after the termination of the shameful, intentionally created, political crisis. I declare, that I will personally nurture this parliament, this newly created coalition. I will never allow the tormenting of the VR, or of the country, which we have observed in recent months. Because no presidential elections are worth political adventurers throwing the country into the abyss of opposition and chaos...."
In the 2007 VR elections, BYuT obtained 156 seats in parliament, NUNS 72, and Lytvyn's bloc [BL] 20, i.e. 248 in total - well in excess of the 226 required to form a ruling coalition. However, Lytvyn's appointment as VR speaker yesterday supported by 154 deputies from BYuT, 40 from NUNS, and 20 from BL, i.e. by 214 deputies. So Lytyvn was elected thanks only to 27 Communist votes and 3 from PoR. Some NUNS deputies already claim that the declaration on the recreation of this new 'democratic' coalition was not signed by NUNS head, Vyacheslav Kyrylenko, but by Borys Tarasyuk, which, in the opinion of these NUNS deputies renders it invalid. However, it seems that the NUNS deputies who supported Lytvyn also support the new coalition, so their number is sufficient to vote through NUNS restarting co-operation with BYuT at their party meeting. But Tymoshenko's bitter outbursts tonight, will not have helped these guys in convincing their fellow party deputies who loyal to the president, to go with them. Officially, the NUNS fraction are currently "finalising" the coalition agreement with their two partners. If this newly-formed is successfully assembled, and if it is to work, it looks as if Lytvyn will have to use all of his cunning. He will have to constantly cajole at least some PoR or Communist deputies to support any of the coalition's parliamentary proposals, for them to be adopted. Right now PoR will not be much worried about the durability of this new coalition. Tymoshenko will be happy with her tactical victory over the president. But what future is there for the badly-split NUNS? According to President’s Press Secretary Iryna Vannykova, President Victor Yushchenko’s position on the situation in the Verkhovna Rada remains the same: state deputies should resume proper work and form a coalition as soon as possible. According to President instead of search for compromise by political partners, collusion between business groups is attempted in the Parliament, which does not have anything in common with protection of national interests. Therefore, President Yushchenko will not take part in parliament’s sitting on December 9, as state deputies suggested and will wait for the deputies to renew their work before meeting them. President is also ready to return to a question of early parliamentary election if he sees that national anti-crisis policy is threatened by Parliament’s inability to function properly." The Ukrainian version includes these quotes from Vannikova: "Viktor Yushchenko considers participation in [any] parliamentary sitting to be a dialogue with Ukrainian society. Instead, for the head of state it is unacceptable when his presence is demanded [merely] to legalise business-tandems. Dialogue between those elected by the nation and the head of state is possible if deputies renew their internal self-organisation and announce political priorities." And perhaps more ominously: "The president has taken responsibility before Ukrainian society for co-ordination of anti-crisis policy in Ukraine and for a consolidated position of [state] authority. Because of this, Viktor Yushchenko is prepared to utilise all means which would allow renewal of financial, economic and political stability in the country." Your blogger considers that Ukraine's largest parties are trying their hardest to settle their considerable differences and make parliament work, otherwise they would be merely sitting on their hands waiting for the president to call early parliamentary elections. Both PoR and BYuT face possible major splits and problems in their own ranks if they succeed. The president knows well that a priority for any PRyBYuT coalition would be constitutional change, diminution of presidential powers, and election of the president by parliamentary deputies. The fearful president Yushchenko has constantly strove for a subservient parliament, but by dismissing PM Tymoshenko in 2005 and dissolving a PoR-led parliament in 2007 he has made too many enemies, and will pay the price for this. There is, however, certainly a good case to be made for the president to be nationally elected, particularly when parliament is dominated by a handful of financial-industrial groups. Victor Yushchenko considers the creation of such a parliamentary majority format quite probable. "Creation of this coalition is quite probable. Formally, today it has [already] been created," said the President. The head of the state forsees serious threats to the democratic achievements of Ukraine as the result of such a political union. "If this consolidation is not checked by means of ideological positions, national interests, [and] democratic interests, it could lead to serious challenges to Ukrainian democracy," said Viktor Yushchenko during press conference. The president mentioned possible threats such as a major revision of the Ukrainian Constitution, in particular, cancellation of direct presidential elections and election of the president by parliament. "These matters, which will ruin Ukrainian democracy, do not correspond to our aspirations. It would cast Ukraine away from the sphere of stability for many years," considers Viktor Yushchenko. In addition, the President declared that he will not permit the possibility of such events [taking place]. "Such attempts to revise the Constitution under someone will not pass in Ukraine," assured Viktor Yushchenko." Yushchenko has not produced any evidence or argument to convince the electorate of his assertions. Your blogger considers the President will not get away with dismissing a possible constitutional majority of 2/3 of parliamentary deputies [if one is formed] for a second time. Lots of speculation that PoR and BYuT will do the unthinkable - join forces in a parliamentary coalition. All the deputy PM's and the economic portfolios would be in the hands of PoR - the remainder split 50-50. Yuriy Lutsenko, Borys Tarasyuk and other NUNS 'renegades' may also sign up to this coalition. The union is to be "guaranteed by the Kremlin and EU"
Oh, and it is "highly probable" Viktor Medvedchuk will become Minister of Justice. Your blogger wonders what will the Pres's response to all of this be..
An interesting interview with Viktor Yanukovych in the current "Russian Newsweek"
Are you for Ukraine being included into the European Union? At the first congress of PoR in 1997 we decided that integration into Europe would be the main objective of our program. For eleven years we not only have not changed this position, but are even more convinced that Ukraine should join Europe. Being territorially in the centre of Europe, Ukraine is already a part of the European community. We have improved our social conditions, have moved our standard of living to toward European standards and principles. Polls show that more and more Ukrainians support idea of integration into the European Union. At least half of citizens of Ukraine are against the country's introduction into NATO. Along what path do you intend to go to the European Union? Some European countries, for example Finland and Sweden, were included into the European Union, without being members of the NATO. But they co-operate with the NATO - take active part in NATO programs. There is an analagous situation with Ukraine. We have reached a high level of co-operation with NATO, and have completed work on a number of programs. We continually take part in military training exercises, in peacekeeping and anti-terrorist operations. Our citizens recognise the authority and influence of this organisation. In the Ukrainian government the question of creation of a European security system is being discussed. What is this system and will it be an alternative of NATO? The time has come to improve NATO. Considering that the European Union has considerably increased its membership in recent years number to twenty seven countries, it makes sense to [re]consider the concept of formation of a collective system of security for the European Union and countries next to it. Ukraine intends to take active part in the formation of such a concept. Certainly, without Russia such a concept is impossible. Such a system is not an alternative to NATO. It could come into being, or as we consider, should come into being, as a result of the reform of NATO. Has the fact that Ukraine sold weapons to Georgia worsened relations between Moscow and Kyiv? We still do not have a full picture whether Ukraine sold weaponry to Georgia. But, having supported to it, Ukraine became a participant in this conflict. Viktor Yushchenko made a huge error. Any third party always should play the role of peacemaker. We consider that a policy of double standards is not capable of solving the problems of frozen conflicts. For these, new laws should be developed, and such international organisations as OSCE or the United Nations, should supervise their realisation. The Ukrainian economy has found itself in a catastrophic situation. What is the government doing about this? ..No-one in Europe understands why Ukraine, instead of tackling the problems in the economy, is participating in international political conflicts, talking about the Holodomor. Certainly, the Holodomor was a terrible crime against Ukraine, but today, before us, there are new troubles, new threats. Why can't Ukrainian leaders unite and create a union? It is not right. Look around, everyone in the world, even the greatest countries, are uniting to fight against the crisis, it is only in Ukraine where there are endless political confrontations. Could you and prime minister Yulia Tymoshenko form a coalition? We are actively working on this at the moment. We consider that the threat of loss of independence, the possibility of social catastrophe should unite our politicians. We should declare a moratorium on all political confrontations. The economic crisis affects every Ukrainian family. Our duty is to protect our people from full-blown catastrophe. Do you expect that help will be more likely to come from Russia, than from Europe? For us, Russia is our biggest trading partner with a trade turnover of $30Bn a year. If Russia is sick, we are sick too, and vice-versa. During my last visit to Moscow we discussed with prime minister Putin, as leaders of political parties, how we will influence the position of governments in our countries. Putin leads his government, and I lead our opposition. Unlike Russian, Ukrainian politicians have became more pro-European. Is it true that Ukraine has changed a lot? Russians and Russian bureaucrats agree that democratic reforms are necessary for Russia. But in Russia they are progressing slowly. In respect of democracy, Ukraine has gone far forward, and it this has already been noticed in Europe and in a series of other countries. Your blogger has omitted bits, because of lack of time, where Yanukovych 'pans' the oranges on several issues. They are worth reading, nevertheless. p.s. Tomorrow Yanukovych and his party may decide whom he is to 'climb into bed' with.